For some reason, the “Ides of April” have become the time to write about “natural” wines in most any publication. I have no proper idea why except that it’s a busy, yet stagnant time as we wait on more important articles such as Bordeaux’s en primeur or spring releases from wineries. So, as there’s not much else to talk about, this topic works very well as a fiery filler in the meantime. I would have largely eschewed it were it not for an article that appeared in a well-known British magazine that talks in broad terms about natural wine in Catalunya. The article fudges a great many base facts to arrive at a conclusion. A conclusion the author was already convinced must be the conclusion as opposed to the one that should have been led to via research and interviews as one source does not a proper article make. I’ve not seen the distributor in question, Cuvée 3000, mentioned in the British trade before so that in and of itself is something miraculous. To set the stage a tad, there are several wine distributors in Catalunya but the two main ones are Cuvée 3000 and Vila Viniteca. The later has generally focused on being more higher-end which left Cuvée looking for another angle that’s turned out to be “natural” wines. So make no mistake and buy into what anyone might say about this being a higher calling, it’s strictly a marketing angle to stand out in a crowded field. 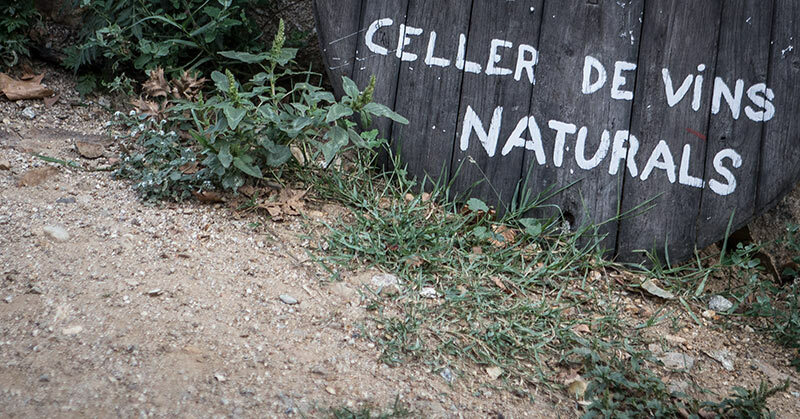 While I can’t recall Vila Viniteca ever flouting its sales figures, Cuvée is claiming a 20% growth in turnover last year and they’re emphatic that natural wines have grown as well. The author of the article has stretched this out to mean that natural wines have seen the same growth which is to say, a “boom”. This is dangerous, much like saying there’s been a “boom” in natural wine bars in Barcelona. It’s very easy to say that if you had two and then another opened, well that’s 50% growth! And then tossing in the actual fact that Barcelona (and Catalunya as a whole) sells more Catalan wines than from any other region now, is impossible to extrapolate how that could mean there are more natural wines sold, but that’s what was inferred. These jumps in logic are unsurprising for a natural wine article as they’re exactly the same manner of thinking in natural wine circles. When faced with facts like adverse compounds and bacteria can flourish if you just let a wine go where it will, the response is always that natural wine is then “more alive”. What’s that supposed to mean? Ignoring logic this way one can say a septic tank is “more alive” as well. And don’t think for a moment that just because “25% of Catalan vineyards now farmed organically” that this translates to natural wine either as the great wealth of this 25% is in DO Penedès going into those wines as well as DO Cava and the amount of natural producers there might require two hands to count. I know this because I visited them. But can one then surmise that Barcelona or more to the point, Catalunya, the “epicenter” of natural wine in Spain? It’s true you don’t hear such things said about other regions of Spain. Barcelona is also more hippie and artsy (take a stroll around Madrid if you don’t believe me) and having a direct line to France, makes it more prone to such natural leanings for sure. But to assume that it means it’s growing and going mainstream is a misnomer. While there are three bars (not counting restaurant/bars) in Barcelona that focus on natural wines: l’Anima del Vi, Bar Brutal (owned by Cuvée 3000), and la Volàtil (owned by the nephew of the owner of Cuvée 3000), this doesn’t really speak to everyone thinking natural wines are the wines they immediately want to have. The are a lot of bars in Barcelona and the majority of wines served in them have been and more than likely will continue to be “normal” wines. People may be “natural curious” and check out a place like Bar Brutal because they’ve done exceedingly well to hype that location to tourists via ads in the in-flight magazines on budget airlines. It’s a bit self-defeating however as I’ve done private tastings and tours for people who have stopped by one of these establishments such as Bar Brutal and then told me that they were scarred by what they drank there. Those deep in the natural wine circles need to remember that what they’re into isn’t what most wine drinkers are into. It’s a fringe taste and ideology as most people prefer fruit over the searing bite of acetic acid or diaper poo brett. Don’t believe me? How many people claim that they want to eat healthily but then gorge on bacon because yes, it’s delicious, much like fruity, “normal” wine. These bars really focus on that wonky end of things although Benôit at l’Anima del Vi does a far better job at bringing in wines that will appeal to a greater audience. There are also some well-known names in the natural circles of Catalan wineries, but those who exist now will most likely stay the same. The reason for this is that many very excellent winemakers are producing stupendous wines that could potentially be “natural” but they stay the hell away from being associated with this. Why would they do this? For the same reason that organic wineries stopped putting their organic certifications on labels in the US. There were so many terrible organic wines that most consumers started thing organic = shitanic. It may sound like I’m saying natural wine is going to die off in Catalunya but no, I’m quite sure there will remain a small group that continues to dig it. Will it grow? Probably not and assuming that it will because someone presents you with a bucket of “truthiness“? Well, beware.